Most bespoke designs do not cost any extra, and because of our flexible production system, usually the lead time is the same! Lintel specification from plans is also a 'no-cost' service. In fact, the only thing we usually charge for is the Lintels! You can ask us what lintels you need. We are obviously very familiar with our lintels and will pick the most suitable lintels for your application. You supply us with drawings (paper, DWG, PDF or standard image files) and we will calculate the loads on each lintel and give you a lintel schedule to suit your design. We require all this information to calculate the loads that are applied to the lintels. If the schedule is in terms of 'duty' ie 'heavy duty' 'medium duty' etc we will not be able to price it accurately since one suppliers 'heavy duty' is anothers 'standard duty'. Best economy is gained from specifying the most suitable lintel for the duty. We have a technical department that spends virtually all it's time designing custom lintels. Typically the customer comes up with a masonry design and asks us for a way to support it. We integrate the lintel with the rest of the structure to achieve the designer's intent. A range of tricky shapes, such as arches in circular towers! 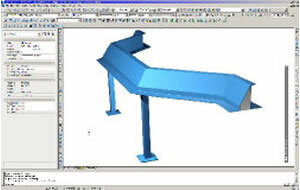 We use our in house design software PEPS-CAMTEK for our manufacturing purposes but we also use AutoCAD to design lintels and integrate with our customers drawings. We are able to supply all our designs as AutoCAD blocks for Architects to integrate directly into their drawings and rapidly check form and fit. We can even supply blocks in your own layer configuration if you give us the details! Go to our downloads page or browse our products tab to download AutoCAD files holding our standard Lintels as blocks.